I’m starting to feel a bit like Ellen and Oprah with the giveaways I’ve been doing lately. Not that it’s a bad thing! I like having the opportunity to share fun stuff with my readers. As you know, I am a self-proclaimed cookbook addict and love finding new gems to add to my ever-growing collection. When I saw that Atlanta chef and cookbook author Virginia Willis was offering copies of her newest cookbook Basic to Brilliant, Y’all: 150 Refined Southern Recipes and Ways to Dress Them Up for Company to review and give away, I did not want to let this opportunity pass for several reasons! First of all, I wanted to support my fellow Atlantan, second, I liked her fusion of Southern and French techniques and flavor, and finally,there was the amazing food photography by Helene Dujardin (aka the blogger behind Tartelette). Okay, and I was also getting to review a cookbook, how fun! The premise of Basic to Brilliant, Y’all is that Virginia offers up one recipe that is good on its own, then tells you how to take it from “Basic” to “Brilliant” by adding extra ingredients, presentation styles, or techniques. I like this concept — have a master recipe and then different ways to change it up — and have seen it in other cookbooks, but not to this extent. Once the cookbook was in my greedy little hands, I knew I was going to have a problem — how was I going to choose one recipe to feature? There was Black Pepper Cheese Shortbread, N’awlins-Style BBQ Shrimp, Deviled Chicken Thighs, Sweet Potato Biscuits, and French Beignets, just to name a few. In the end, it was the Deviled Chicken Thighs (Poulet Grillé à la Diable) that called out to me. A French twist on oven-fried chicken, it called for two types of Dijon mustard, which instantly brought back memories of the summer semester I did in France in college. I don’t know who came up with it, but we would buy baguettes and jars of Dijon mustard to dunk chunks of bread into. The mustard was pungent enough that it felt like it was burning the back of your head and I guess we were gluttons for punishment because we kept going back for more. Reminiscing aside, I liked that that this could be a weeknight recipe and made use of ingredients I usually have on hand. To me, there wasn’t a lot of heat (but then look who you’re talking to! ), but there was plenty of flavor and I’m a sucker for oven-fried chicken thighs. This is definitely a repeat recipe! And I’m excited to try out more of the recipes — like the N’awlins-Style BBQ Shrimp, which is looking really good right now! Am I making you hungry yet? Are you dying to thumb through the book and make your list of recipes that you want to try? 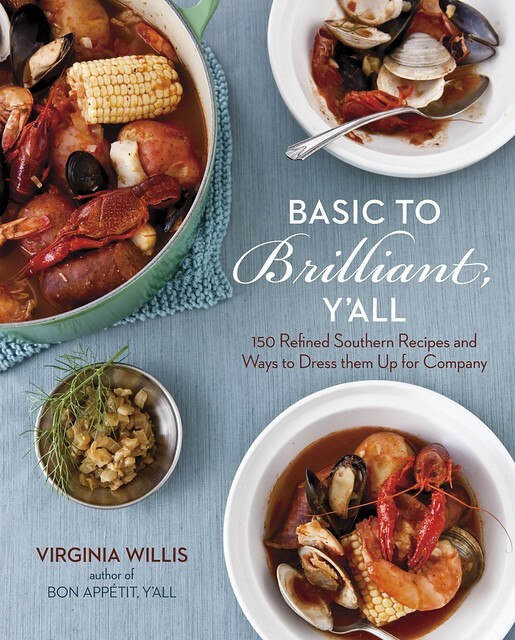 Good, because one of you is going to win a copy of Basic to Brilliant, Y’all: 150 Refined Southern Recipes and Ways to Dress Them Up for Company! Giveaway is limited to U.S. residents age 18 and over. The giveaway runs from Monday, January 21st through 9pm Eastern time on Friday, January 25th. Once I’ve selected a winner, I will email you to get your contact info, so make sure you enter an email address when leaving a comment (it won’t show up in the comment). UPDATE! 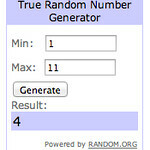 The giveaway is closed and we have a winner! Disclosure: The book for this giveaway is being provided by Ten Speed Press. I was given a copy of Basic to Brilliant, Y’all for review, and all opinions shared are my own. In French cooking, any meat or poultry seasoned with mustard and hot pepper and then coated with breadcrumbs is called à la diable, since the devil, or diable, is associated with anything hot and fiery. The French, however, aren’t known for a whole lot of heat in their cooking. There are a couple of variations you can try if you want it hotter. You can obviously increase the amount of red pepper, but I also like using powdered chiles—not chili powder, or at least not the blend that often includes cumin, oregano, garlic powder, and salt. I use a powdered chile, such as ground Hatch or Dixon chile peppers from New Mexico. Preheat the oven to 375°F. Line a rimmed baking sheet with a silicone baking liner or piece of aluminum foil (this will help with cleanup). Combine the two mustards and red pepper in a small bowl. Crack the eggs into a shallow bowl or pie plate and whisk lightly with a fork to blend; season with salt and pepper. Using a pastry brush, brush the mustard mixture all over the chicken. Dip each piece in the eggs, coating evenly on all sides. 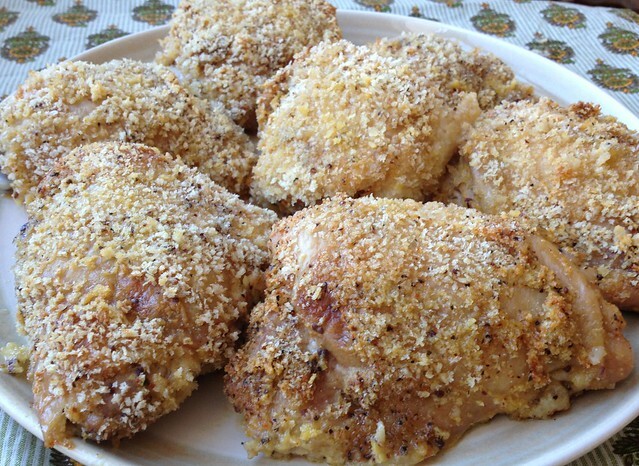 Sprinkle with the breadcrumbs, coating as evenly as possible. Place the chicken pieces on the prepared baking sheet. baking sheet. Tent with foil and let rest for 3 to 5 minutes. Serve immediately. The simple addition of two ingredients and the use of boned chicken thighs takes this Basic recipe to Brilliant without a whole lot of effort. ham, prosciutto, or Serrano ham ready for use. Season 6 boneless, skinless thighs on both sides with salt and pepper. Place the batons of cheese in the thigh bone cavity. Fold the thigh to close. Place a piece of ham on the work surface, place the filled thigh, seam side up, on the ham, and roll to wrap the chicken in the ham. Repeat with remaining ingredients. Proceed as directed in the Basic recipe, first brushing with the seasoned mustard, then dipping in egg, and finally coating in breadcrumbs. Bake until the juices run clear when pierced with a knife and the topping is a rich golden brown, about 35 minutes. Serve immediately. The rest of my family lives in the south, but I’m up here in New England. I’d love to surprise them on their next visit with some delicious, authentic southern food. ps, I left a comment on Virginia’s website as well…. This looks so good! I spent a Spring semester in France (with my french teacher). I would love to see how she fuses the two cuisines. I’ve been interested in Basic to Brilliant Y’all and enjoyed your review. An southern twist on classic French cooking in very enticing! Wow, the cover alone is enough to draw me in. I lived in Louisiana until I was 10, and a crawfish boil is one of the foods I miss the most! I’d love to see her tips for seafood. As for my own “basic to brilliant”–my father came up with a praline recipe, which on its own is pretty darn brilliant. One time I made the pralines with eggnog instead of milk, which was a whole new level of decadence. I add a bit of cinnamon, nutmeg and a small bit of butter to my butternut squash pumpkin soup. Left comment on Virginia’s blog. I follow spice bites on Twitter. I shared giveaway on Facebook . Previous post: White Cheddar Herb Blue Cornmeal Biscuits + Bob’s Red Mill Giveaway! Next post: *CLOSED* Triple Mango Smoothie + Stonyfield Farms Blends Yogurt and Blendtec Blender Giveaway!